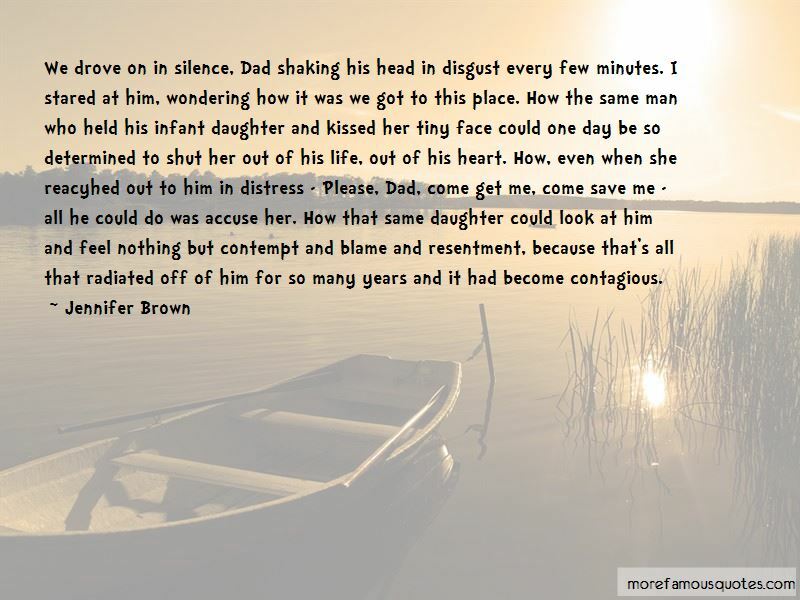 Enjoy the top 63 famous quotes, sayings and quotations by Jennifer Brown. “I like that hot air balloon.' I pointed to the ceiling where an antique looking wooden hot air balloon hung. I don't know if it's possible to take hate away from people. Not even people like us, who've seen firsthand what hate can do. We're all hurting. We're all going to be hurting for a long time. And we, probably more than anyone else out there, will be searching for a new reality every day. A better one. “I sat back and looked at it. It was ugly, dark, uncontrolled. Like a monster's face. Or maybe what I saw there was my own face. I couldn't quite tell. Was the face the image of something evil or the image of myself? “Will you ever forgive me? " I shot back, leveling my gaze directly into his eyes. “I've been thinking a lot about the word "everything." Whenever something horrible happens, you hear people say they "lost everything." They lost their house or their car or their stuff or whatever, and to them it feels like everything. But they have no idea what it's like to lose everything. I thought I knew, but now I realize even I haven't lost everything, because I still have that polka-dot swimsuit in my memory. I still have those ice cream nights and the scorpion that scared Marin and the Barking Bulldogs sweatshirt and the robins-egg-blue nail polish. Somehow having those things makes the other things matter less. “I didn't answer. Just shook my head and let the tears roll. “Growing up, we were taught over and over again what steps to take in case of an approaching tornado. Listen for sirens, go to your basement or cellar, or a closet in the center of your house, duck and cover, wait it out. We had drills twice a year, every year, in school. We talked about it in class. We talked about it at home. The newscasters reminded us. We went to the basement. We practiced, practiced, practiced. I understand that it would be easier for you to think of him as a hero. But, Valerie, he did kill a lot of kids. Probably not a lot of people are going to think of him as a hero. It was one thing to lose the people you love. That happens to everybody. But it was another thing to lose them because you just ... faded away. I didn't want to fade away. “His fingers gouged into my leg harder. "My sister was in that cafeteria," he said. "She saw her friends die, thanks to you and that puke boyfriend of yours. She still has nightmares about it. He got what he deserved, but you got a free pass. That ain't right. You should've died that day, Sister Death. Everyone wishes you would have. Look around. Where is Jessica, if she wants you here so bad? Even the friends you came here with don't want to be with you." "Let go of me," I said again, pulling on his fingers. But he only pinched tighter. 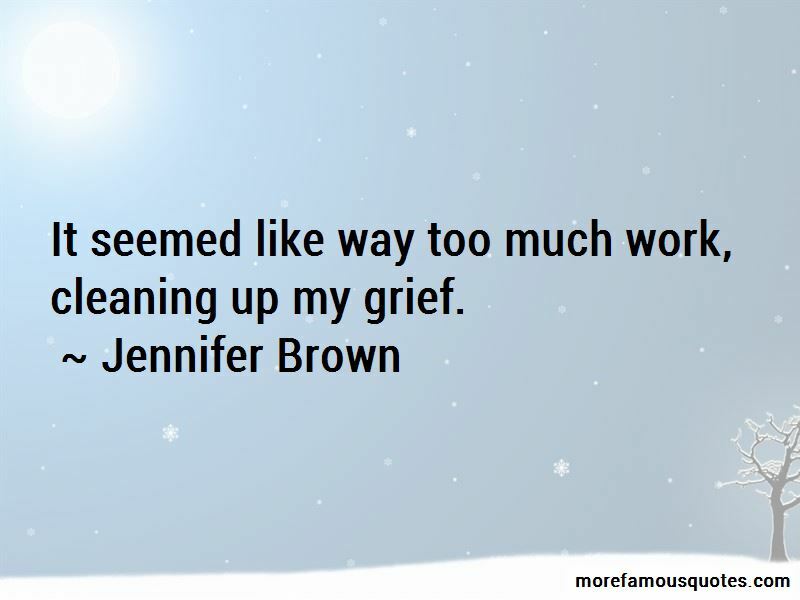 Want to see more pictures of Jennifer Brown quotes? 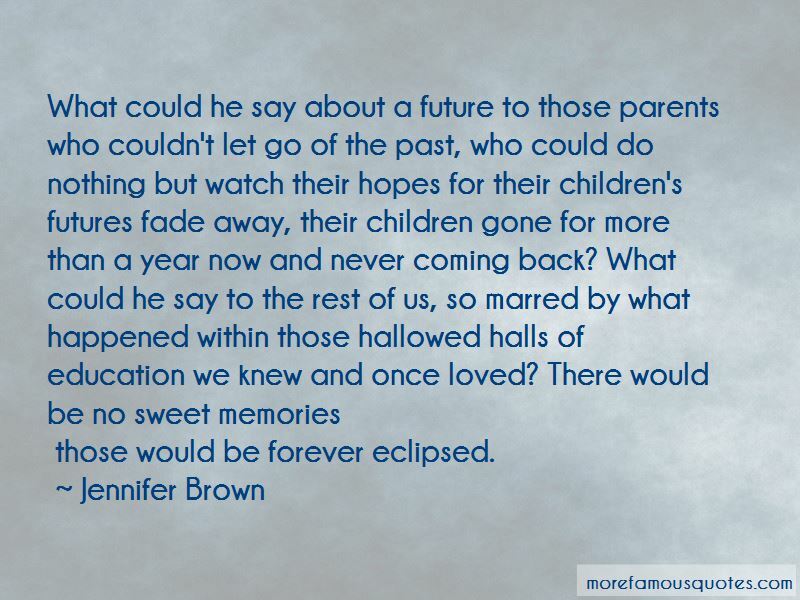 Click on image of Jennifer Brown quotes to view full size.